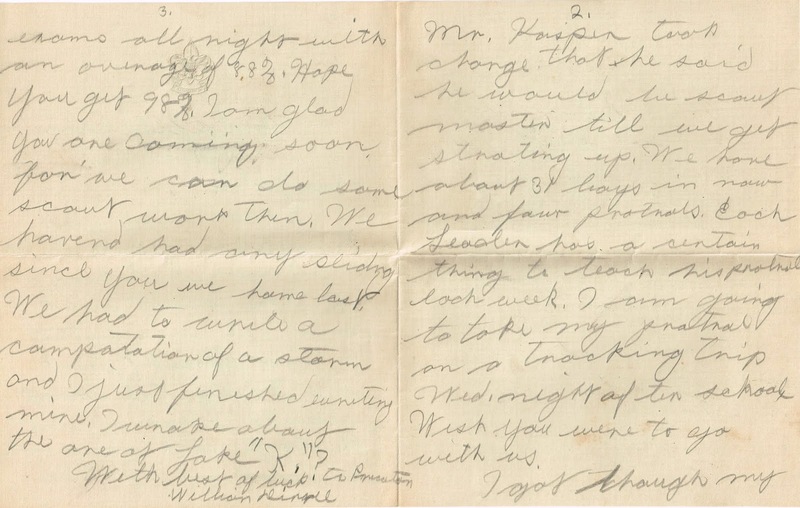 A rare glimpse into early Boy Scouting in Ridgefield is offered by a letter from one scout to another, mailed in 1921. William Dingee, then 16 years old, is telling his older friend, Adelmar “Del” Bryon, then 22, about current scouting activities. 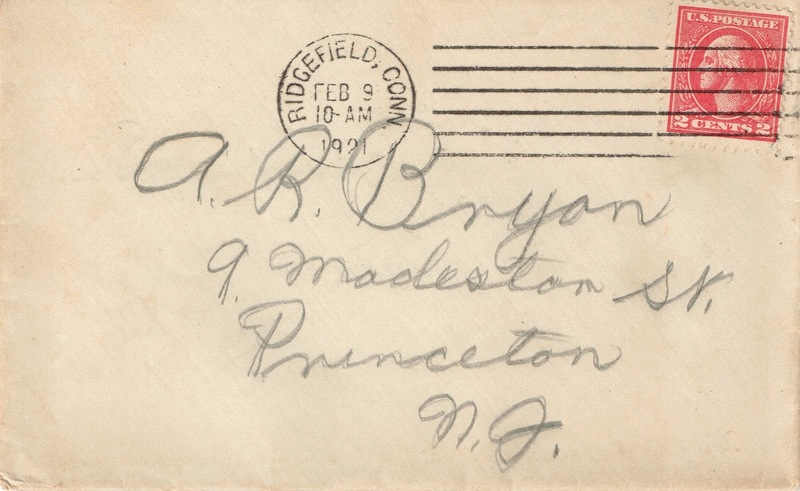 Bryon, who was a member and possibly a leader of the local troop, was off studying at Princeton. Department, and belonging to many local organizations. 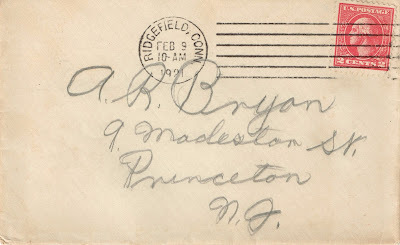 Dingee died in 1980, Bryon in 1995. 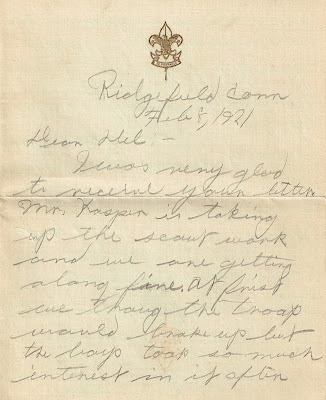 The letter speaks of Mr. Kasper — that’s Joseph F. Kasper, an early leader in Ridgefield scouting (some have said he founded Boy Scouting in Ridgefield; the letter suggests he wasn’t the initial leader, but he may have been the first to make things work). along fine. 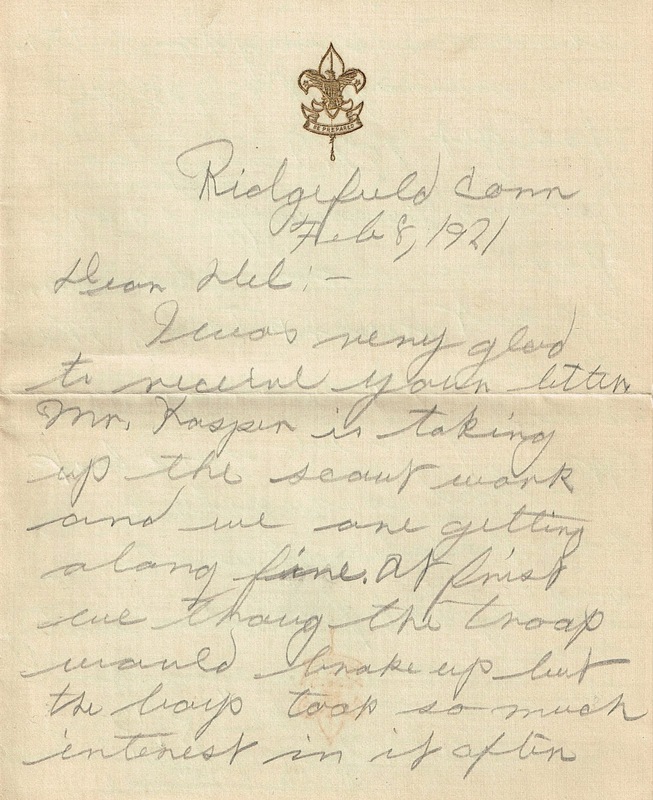 At first we thought the troop would break up, but the boys took so much interest in it after Mr. Kasper took charge, that he said he would be scout master till we get starting up. We have about 31 boys in now and four patrols. Each leader has a certain thing to teach his patrol each week. I am going to take my patrol on a tracking trip Wed. night after school. Wish you here to go with us. “I got through my exams all right with an average of 88%. Hope you got 98%. 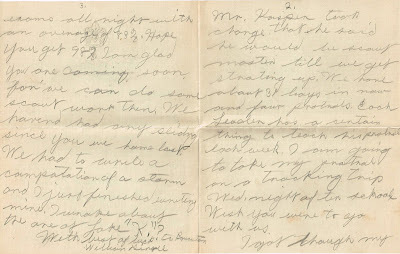 I am glad you are coming soon, for we can do some scout work then. We haven’t had any sliding since you were home last. We had to write a composition of a storm and I just finished writing mine. I wrote about the one at Lake ‘K’? [probably Kitchawan, in Lewisboro].